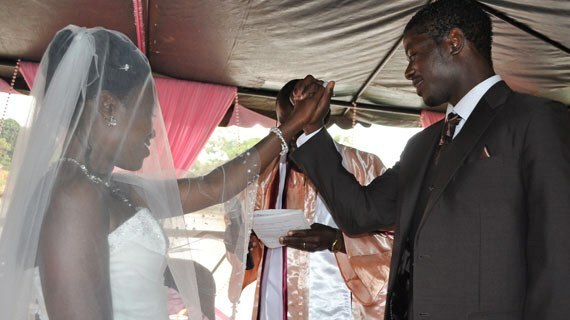 Kenyan international and HAGL striker (Vietnam) Allan Wetende Wanga on Saturday 3rd September tied the matrimonial knot with his sweetheart Brenda Mulinya in a colorful wedding ceremony held at the Tayiana gardens in Nairobi. Flanked by his parents Frank Wetende.,himself a soccer coach from Western Kenya, and mother Pastor Noel Wetende, Allan could not hide his joy as he was handed the love of his life and mother to his child (Jayden) Brenda Mulinya by her father Francis Mulinya. Brenda is a leading journalist in Kenya working with NTV. Floating on water on a make shift pulpit at the Tayiana Gardens , the two vowed to love each other and live together in sickness and in health, in bad times and in good times till death do them part. The ceremony could have easily passed for second national soccer team assembly with Ulinzi Stars’ defender Mulinge Ndeto and City Stars’ George Odari as part of the groom’s men. Ulinzi Stars defender Geoffrey Kokoyo was the paparazzi camera man. 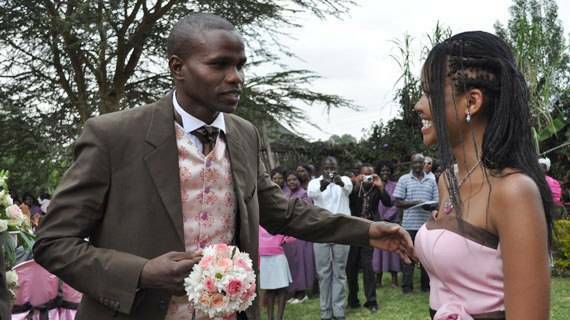 Coach Jacob Ghost Mulee must have loved watching the proceedings from the bench as his former Harambee Stars’ striker had outrun all to secure the gorgeous bride. Former national team players George Owino, Wilson Obungu, George Midenyo and Rangers FC team manager Willis Waliaula mixed freely with the many journalists and other members from all walks of life who had also gathered to witness the big day. Radio Jambo’s sports commentators Diamond Okusimba and man Gidi were also present to narrate the stories as they do best behind the microphone. For the journalists who had left behind their tools of trade, they must have been salivating not only at the sumptuous delicacies on offer but the many up-close interview opportunities and the million dollar shots that included dazzling fashion trends spotted amongst the guests. 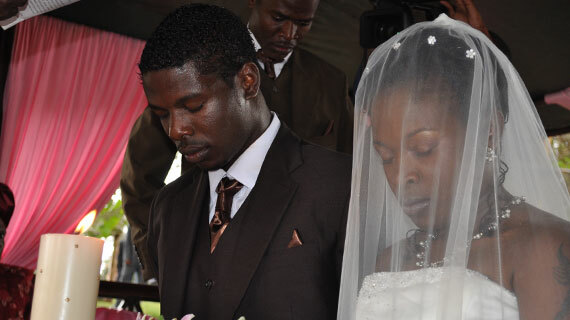 Radio Jambo’S sports producer Michelle Katami was the day’s matron while award winning sports photographers clicked the moments away as the two expressed their love for each other before friends and relatives in style aboard a makeshift vessel floating on water and surrounded by beautiful scenery. The wedding date coincided with the Kenya vs. Guinea Bissau match. As the reliable striker was securing a brilliant brace outside the pitch (wife Brenda and baby Jayden) ,Kenyan fans were agonizing over the struggling performance of the team at Nyayo Stadium but a late Oliech breather made sure all parties went home dancing. The days groom had sneaked in his best wishes for the national team a few minutes before the match. “It was unfortunate that the dates clashed but I wish the team all the best as they take on Guinea Bissau, Brenda and I have waited for this day for long and we are both happy it has finally come.” Said an excited Wanga who looked elegant in a brown three piece suit and expensive shoes.